The head of Naval Surface Forces Pacific will resign from his position later this week following two collisions in the Pacific involving the USS John S. McCain and USS Fitzgerald that claimed the lives of 17 sailors combined, defense officials recently told Defense News. Vice Adm. Tom Rowden will step down from his position at Naval Surface Force Pacific following a recommendation from Adm. James Caldwell that he be relieved. Rowden was expected to retire Feb. 2, but with him stepping down, Rear Adm. Richard Brown will take his place. Caldwell was appointed Consolidated Disposition Authority for disciplinary action regarding the McCain and Fitzgerald collisions. Caldwell provided his recommendation to senior Navy leadership, including Chief of Naval Operations (CNO) Adm. John Richardson, over the weekend. His findings called for disciplinary action, according to USNI News. Rowden and Pacific Fleet Commander Adm. Scott Swift announced their retirement shortly after the incidents occured. Commanding officers and senior leadership on the USS John S. McCain and USS Fitzgerald were relived following the collisions. Capt. Jeffery Bennett, Commodore of the Japan-based Destroyer Squadron 15, Task Force 70 Commander Rear Adm. Charles Williams and Commander of U.S. 7th Fleet Vice Adm. Joseph Aucoin were also removed from their positions. 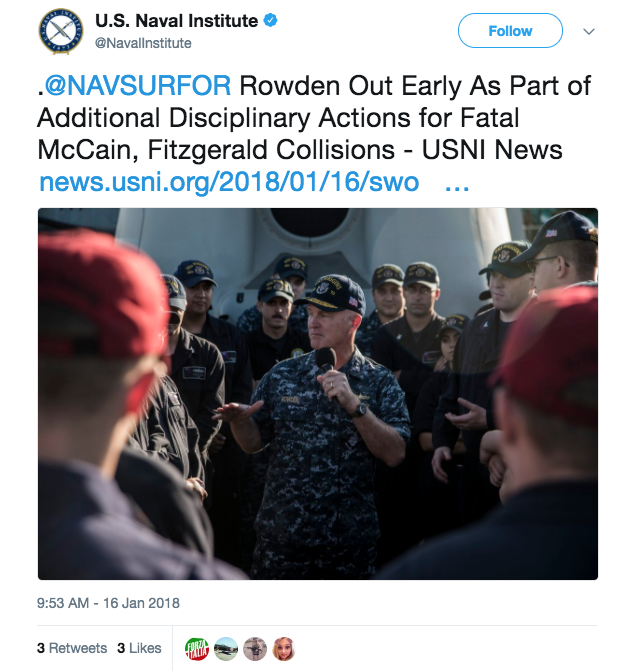 Richardson and Secretary of the Navy Richard Spencer are scheduled to appear in front of the House Armed Services Seapower and Projection Forces Subcommittee to testify on the reviews of the McCain and Fitzgerald collisions, USNI News reported. In November, the U.S. Navy released an official report after its investigation into the fatal destroyer collisions, and it has found that the accidents were primarily due to the crews’ complacency, over-confidence and lack of procedural compliance.